Better understand your customer groups, identify the most active customers for your organization and maximize your ROI. Whether you’re launching or testing campaigns, looking to increase cross-sell and up-sell revenue, or planning to open a store, the software helps you develop and execute more successful marketing programs. Analyze the success of your marketing tactics on your own. The intuitive user interface guides you through the process, allowing you to classify customers in a few steps. Use the Scoring wizard to build models to score your data. After you run an analysis, the easy-to-understand, color-coded output is ready for export into Microsoft Excel. Analyze customer data in multiple ways to choose the approach that best meets your objectives. For example, you can classify contacts based on similar demographic or behavioral characteristics to guide your acquisition strategies. Performing recency-frequency-monetary value (RFM) analysis can also give you insight into the lifetime value of your customers or donors. Connect to Salesforce.com to extract data, collect details and perform further analysis. 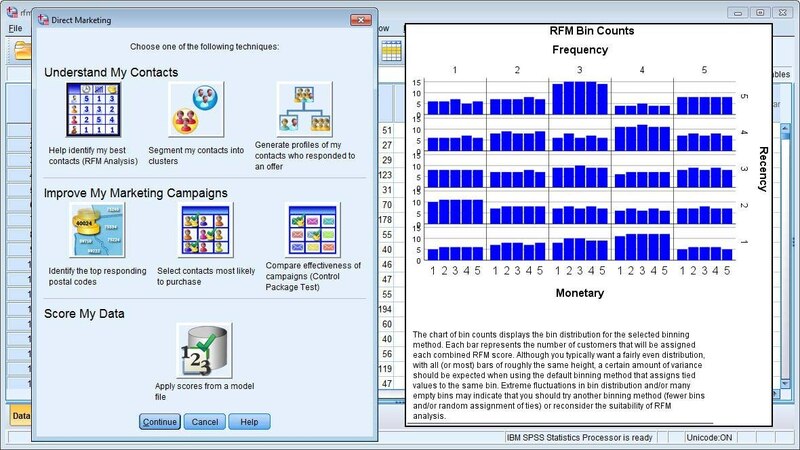 IBM SPSS Direct Marketing requires a valid IBM SPSS Statistics Base license.